Should wine trips be a tiresome journey where fun is replaced by apathy and bonding lost to exertion? I hope not. A wine trip regardless of geography ought to be fun, frenzied and lusty, any order will do. These events bring together master wine producers, merchants and restaurateurs who rightfully obsess over every detail, albeit often forgetting that the final, and arguably the most important hurdle is in its presentation and pour; this I’m afraid is often in the hands of a novice. Wine producers wishing to sell their wares invite wine merchants (in this case Corney & Barrow) and teams of hospitality staff, tracing well-grooved routes across the old world, often revisiting wine makers to learn what it is that they do so well, then entrusted to go back home and sell the tale. So much that meets the diner or patron at the restaurant’s table has been through an exhaustive and often neurotic process of sourcing, transporting, producing and finally serving. The dinner table is like that of a mosaic with so many small fragments that on their own mean little, however in unison sing with majesty, unless you drop the soup etc. merchant that sells to the Lussmanns table. However, one enjoys and greatly appreciates the opportunity to meet with a producer, especially when they are in Europe. Galicia, an autonomous community in Spain’s northwest, is a verdant region with an Atlantic coastline. The cathedral of regional capital Santiago de Compostela is the reputed burial place of the biblical apostle St James the Great, and the destination for those following the Camino de Santiago pilgrimage route. The western cliffs of Cape Finisterre were considered by the Romans to be the end of the known world. But it’s simply the terrain that is more Ireland than Spain. The abundance of bagpipes reinforcing its Celtic heritage, and the sense of tranquillity that makes the trip. Why is it that so much of Europe works to a slower and calmer working clock but still commands unbridled productivity rates often better than our own? Maybe it is the role of numerous plazas on the Continent acting almost as traffic calming chicanes forcing the pace of life to slow and motivating people to look, talk and more often enjoy a seat and a small glass of vino. 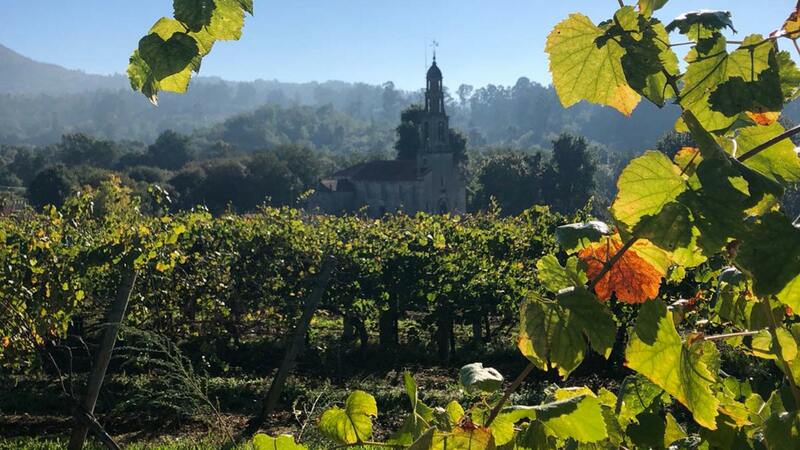 Galicia, land-based at the tip of North West Spain, witnessed the rise of the noble family La Maza, who owned a handful of traditional manor houses in the area, known locally as “Pazos” – a sobriquet for “palace”. The Pazo that bore the family name was their favourite, and legend says an Albariño vineyard flourished in the majestic courtyard. Pazo la Maza Albariño pays homage to this unique, local grape, and to the epic landscape, whipped by constant breeze and tides coming from the Atlantic Ocean. A refreshing, yet intense wine, combining delicate orchard fruits and citrus fragrances. You can, naturally, enjoy this at Lussmanns, or direct from Corney&Barrow. Thanks to Pippa Gardiner for her fabulous photos of the Vineyard and region.